It was winter, early in 1970. The first three proofs, Awareness, Birth, and Geometry were developed in the summer and fall of 1969. At the time I attended the University of Michigan. I managed to cobble together B- grade point average for my first freshman term. As my interest in afterlife intensified, my interest in school waned. My attendance got worse. Finally, after missing three consecutive math classes, I realized I had no idea what the professor was talking about. I had to drop out. I had no choice. I was too far behind. I didn't put school first. The University of Michigan is a tough school. A lot of people don't make it when they focus on the classroom. If you don't focus on the classroom you have no chance. Afterlife was my primary focus. I knew this was real. It is impossible to focus on something else when you know what happens at the end of life, especially when no one knows about it. So I decided to devote myself full time to the pursuit of afterlife. It sounds more glamorous than it is. I was young. I had no life experience. I had some vague notion of writing a book, lecturing, or a combination of the two. That was a fantasy. The reality was I had no money, no job, and no prospects. Meanwhile my father was a raging alcoholic that hated me on sight. So I had no home either. This wasn't a good foundation for much of anything. I was young. I thought it would be OK. I made plans to move to East Lansing (the home of Michigan State University). I had a friend there. Other than that the city was an arbitrary decision. To me it was the first step in a long journey. It didn't work out that way. My friend rented the house. He was enrolled for winter term of 1970. During the previous summer we had worked together as camp counselors in up state Michigan. Summer camp was a fun time. Northern Michigan was beautiful. There were young men and women on the staff. We had a blast. In Lansing all of that was gone. He lived with his parents and rarely came to the house. I had no friends. As much fun as we had during the summer, it was the opposite in the winter. I was lonely. This was the first time I experienced life without friends. It was a dark time. Still I clung to the idea of afterlife like a bit bull. I wouldn't let it go. I decided to take a fourth trip. I would do this alone, only this time I would have a tape recorder. I would record the entire experience from beginning to end. Looking back on this, fifty years later, I can't believe I did this. It was dangerous. On the other side, it was courageous. The tape recorder insured I wouldn't miss anything. It wasn't pleasant but it was effective. I still have the transcript after all these years. Here's an excerpt, about two hours into the trip, while I was surrounded by complex hallucinations. Everything said while "under the influence" is in red. Humm… It's really a mind thing. What is going down in my head and what's going down on that tape recorder are two completely different things. There's on hundred percent in my head and one hundredth of one percent on the tape recorder. I thought I heard somebody out there… Wait a minute… The traffic has slowed down enough so that one car goes down the street I have a tendency to build it way up out of proportion. Oh, my mind. This was an insane thing to do. An insane thing to do… I hope everyone appreciates me putting my head on the line because that is exactly what I did. Oh… I am one high dude, man. I wish I could be totally sure that no one was going to walk in. This room is just so damned complicated, like trying to hit the moon ten years ago. Just shooting out into space. Oh wow, I look up at the wall and it is on a weird angle. It reaqlly does. It looks like it is on a weird angle. Eight hours I'm going to be like this. Eight hours! I am definitely messed up. Messed up I the head and I mean just the head. Oh my God. There are hallucinations all over the place. Wow. They're just all over the walls (pause). I don't know what I'm going to do. I'm just looking out. I don't even like to close my eyes. I hate to admit it but I'm getting to that point… now what's the point? Oh yes. I hate to admit it but I'm getting too high. They're gone! The hallucinations are gone! These hallucinations that seemed, YES!!! These hallucinations that seemed so complicated before seem trivial now (There is a long period of silence). That is mellow! That is mellow!!! Wow! That is the type of thinking that is going to make me see this thing. See? It is mind thinking. Yes. Mellow. Man, mellow, mellow, mellow, mellow, mellow. Hum. I mean… I can't even remember what I….. That was like a big deal to me and I don't every remember it. Part of this confusion I guess… I don't know. This is mellow man. You're actually experiencing dimension. I know that know, but I still don't know how it works. Wham, it's there. Then it's gone. Complications and dimension. It is a whole different way of looking at it. Look at the question of dimension through complications… Wow, that's really strange. There is a definite parallel. Let me try to get it again in my mind. Yea, and I can see it work. I like back up in my mind. Back up. I'm like a single point and when you back up you absorb more than you normally can and that is dimension. Bingo! That says it all. That is a word for word transcription, while high, from 50 years ago. Do you see what just happened? This is a first hand account of afterlife being handed down from the heavens. There is no mistaking it. I am imparting this knowledge, from fifty years ago while hallucinating, that my mind is like a single point during life. When overwhelmed with complications, it suddenly it backs up in space and absorbs the environment in total. The hallucinations, that were huge to a mind that was a point, are trivial to the mind that is now space. The mind changed dimension, right here. You can hear it on the tape. That's the answer, right there. Whoaaaa! There is just so much going down. I am in a room, with nobody, and it is complicated. I mean COMPLICATED!! This must be the paranoia. People try to get away from this. Ohhh.. COMPLEX!! Oh, wait a minute. Wait a minute. I've got these things from my old trip. Yep, same kind of thoughts. Now that is even too high for me. Dimension I'm beginning to get some kind of conception of. Now what I've done is I have stepped back in my mind and all these complications have become nothing. They've become trivia. And that is a dimension. Wow… Let me see… I do feel a rapport with these papers. One high person to another. "MEMORY AND DIMENSION WORK TOGETHER AND THAT IS WHY THINGS BECOME MORE COMPLICATED"
Wait a minute. Memory and dimension work together and that's whey things become more complicated. Wait a minute… Memory another dimension. That is a thought! That's just it. You can see it work. Let me explain it to you. Memory and…. You can see your memory. It's strange. They're gone! The hallucinations are gone! These hallucinations that seemed, YES!!! These hallucinations that seemed so complicated before seem trivial now. Then, one moment later, I announce the hallucinations are gone. Notice the terms I used. I didn't say they disappeared. I said they are trivial. I describe this transition as going from complicated to trivial. This is a mind thing. Here is an approximation of the environment after the event had taken place. Notice how the hallucinations have become much smaller. They are less intense. From my perspective they've gone from complicated to trivial. In one instant, hallucinations went from complicated to trivial. It isn't the hallucinations that changed. The hallucinations remained the same throughout. It is the MIND that changed. Before the event the mind was small (a point of view) at the center of the environment. After the event the mind was large (backing up as it increased in size). Hence, the hallucations that were complicated before are trivial now. The mind became bigger. The hallucinations that were complicated to the small mind, are insignificant to the large mind. The large mind (which is now space) dwarf the hallucinations in size. Yea, and I can see it work. I like back up in my mind. Back up. I'm like a single point and when you back up you absorb more than you normally can and that is dimension. It is this "backing up in my mind" that I want to get straight. That can mean a lot of things. We have to get this exactly right. To get it right, I want to illustrate the point. This is before the event. The mind is represented as the red dot inside the head. I am sitting in the environment looking out. I describe this perfectly by saying, "I'm like a single point." Then the change takes place and the mind transitions from a point to space. As an eyewitness account going through this transition I explain it like this, "I like back up in my mind. Back up. I'm like a single point and when you back up you absorb more than you normally can and that is dimension." To be clear, backing up in my mind does not mean the point moves. It means the mind gets bigger. It backs up (grows) in all three dimensions as far as it can expand. It expands in length, width, and depth. It is a three dimensional expansion, starting from its center location, to the outer reaches of the environment. This statement emphasizes the mind as space, "when you back up you absorb more than you normally can and that is dimension." Absorbing more than it normally can means the mind has expanded. The mind, in its new enlarged state, absorbs the environment in total. Dimension means surrounding space. Here is another view of the mind backing up to become space. This is shown is four steps for clarity, but it happens in an instant. This is an attempt to show the mind expanding three dimensionally. The mind "backs up" in all three dimensions. When it does it can absorb the environment entirely. Proof four, Proof Of Afterlife By Memory, explains how the mind transitioning from point to space proves the Kingdom of Heaven and life everlasting. I. Is The Human Mind Analog Or Digital? There is a fundamental difference between recording analog or digitally. Take sound for example. An analog recording is a vinyl record. A digital recording is in memory. An analog recording means imprinting the sound onto a medium. A vinyl album is recorded by pressing a stylus into a soft medium. The sound impulses are pressed into the medium. The stylus cuts one continuous groove in the medium, circling toward the center. A digital recording uses a different technique. In a digital recording sound is converted into electrical impulses. These impulses are converted into numbers. The numbers are stored in computer memory. To play back an analog recording we run the stylus down the continuous groove. This imparts a vibration in the stylus that gets amplified, to reproduce the sound. To play back a digital recording when read numbers from memory, convert them back into electrical impulses, and amplify them. Audio purists claim the analog vinyl record has superior sound quality over a digital recording. The quality of a digital recording can be improved by upping the resolution of the recording. Increasing the resolution makes a digital recording indistinguishable from an analog recording. One undeniable advantage of a digital recording, over an analog recording, is that it doesn't fade over time. Each time you play back a vinyl record the recording's groove gets slightly worn. When you play back a digital recording the numbers get read from memory. Nothing wears down. A digital recording, played 100 years from now, will be an exact copy of the original. This illustration shows are fairly accurate representation of the human eye and brain. Light comes into the eye through the cornea, then through the lens, and finally onto the retina. In the retina light fires nerves. The impulses from nerves are sent through the optic nerve into the lateral geniculate nucleus in the brain. From there they are sent to the visual cortex. It is in the visual cortex that the outside world is manifested. Note: We are using the example of perceiving the environment visually for clarity purposes. This does not imply that non-sighted people record any less information than sighted people. Nor does it mean that non-sighted people experience any less of the environment than sighted people. Non-sighted people experience the same richness of life as sighted people. They merely experience life in a different manner. It is however complete in every way. The receptive field shown above is where light hits the inside of our eye. 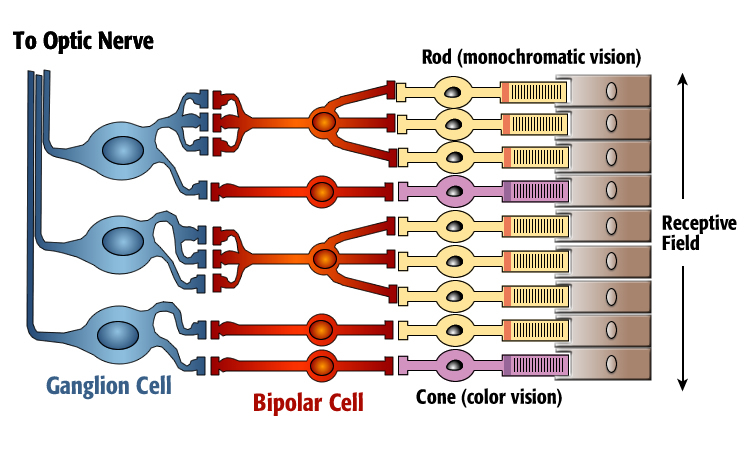 Embedded in the receptive field are rod and cone cells. Rod cells (shown in yellow) detect monochromatic vision (black and white). Cone cells detect color. These nerves send impulses to the bipolar cells. There is some logic processing at the bipolar level. Then the output is sent to the ganglion cells where information is processed further. Then the data is sent out the optic nerve to the brain as shown here. 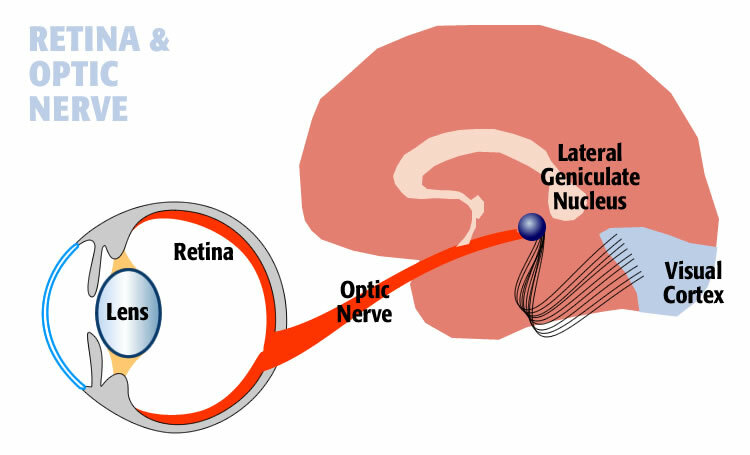 In the retina light and color gets converted into electrical impulses that are transmitted via nerves to the brain. This has a earmarks of a digital recording. What you do not see is the recording using up medium, such as vinyl or paper. What you do see if light and color being converted into electricity, then transmitted via wires so it can be stored memory. The human mind uses digital recording techniques. Digital recording is made up of data stored in memory. A digital recording, when played back later, will be exactly the same as when it was recorded originally. It is information based. It is hardware independent. A digital recording retains its quality. It remains pristine regardless of time. Whether played today, or 1000 years from today, the recording will be identical. They are an exact bit-for-bit copy. Information, stored in computer memory, remains the same over time. Imagine looking at your backyard pool. Your environment, upon close inspection, is made up of tiny dots or pixels as shown by the inset. Each square of color (in the inset) is actually one pixel. The color of that pixel is being picked up by cone and rod cells, processed digitally, and sent out the optical nerve to the brain. In the brain this information is assembled into your environment inside the visual cortex. Digital cameras capture images using a CCD (charged coupled device). The CCD is similar to the retina in our eyes. The CCD is represented by an array of small dots called pixels as shown below. An image captured this way is called a raster image. A raster image is a series of dots arranged in columns and rows. A typical camera is made up of thousands of tiny colored dots. One square inch of the screen will be made up of 5,000 colored dots. The dots are so small and so close together that our eye actually blends them together to form a continuous tone photograph. The picture is nothing more than small colored dots arranged in columns and rows. If you looked at a camera CCD under a microscope you could see the array of tiny color dots. Shown above is a matrix that is 2000 pixels wide by 1400 pixels high. The inset shows the pixels at the upper right corner of the photo. In the inset are these corner pixels magnified. The first four pixels are marked by red box around each one. The color (hue and brightness) assigned to each of those four pixels is shown in yellow. Each of the four pixels has 16 bits of memory wired to it. Stored in that pixel's memory location is a 16-bit number that represents that color. A digital camera takes a picture when you press the button. It is a one time event. Human memory is more like a digital video camera than a still camera. It takes pictures of reality continuously like a movie. In the section above we looked at the pool at 12:00 noon and captured that reality into memory. However, that was just one moment. The next moment we have a new environment. Awareness stays in the present. Realities move progressively to the right as they get filed away. Think of these frames as new realities stacking into memory. The frames of the past move to the right. As time moves, memory absorbs new environments. The dimmed slices represent former present moments that have been filed away into memory. Reality (the environment around us now) is the present. It is where we are. It is vivid. The further we get away from reality the more memory appears to fade. This illustration above shows reality at 100 percent opacity, frame 2 at 50 percent opacity, frame 3 at 40 percent opacity. This is intended to signify how memories fade as we get further away from them in time. Memory fades over time. A memory of five minutes ago seems much different than reality. Reality is pristine. The memory of past reality is vague. The human mind operates like a digital video camera, capturing bit-for-bit realities into memory. There is however, one important difference between the camera and our mind. The camera has a playback feature. The human mind does not. So what you have is a human camera capturing scenes entirely as quickly as they unfold. These are all perfect scenes filed away in memory, yet we have no ability to play them back. That means that reality, and the memory of reality, are identical in quality. It is our position in time that makes them appear to be different. 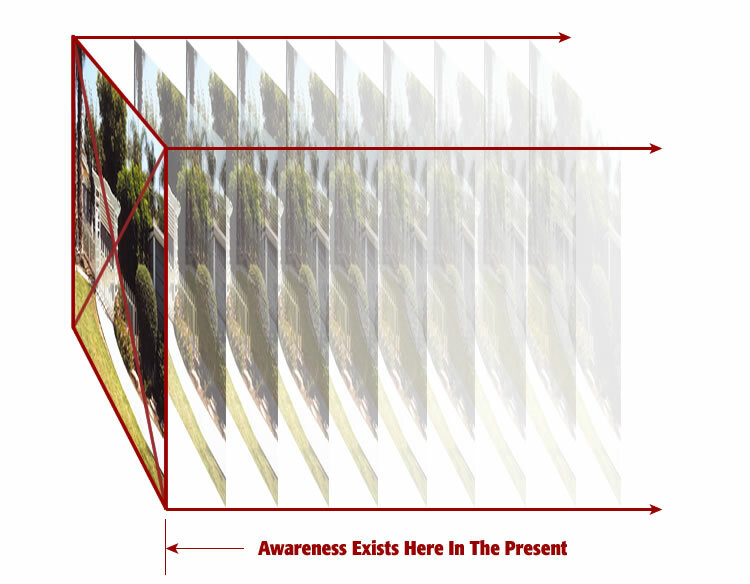 When awareness sits in the present, the present is pristine. When awareness sat in a moment five minutes ago, that moment was pristine. There is no difference in quality between the two moments. Both exist, in infinite detail, within memory. Thus, memory and remembering are two completely different things as follows. We tend to believe that our memory is here to serve us just to help get through life. Real memory is bigger than that. Memory is our huge cocoon surrounding our lives always. We are live inside our memory. Memory is the environment around you now and in the past. Every moment your have experienced from conception to now is in your memory intact. It is exactly as you experienced it the first time. The only difference is that you are not in that moment now. The difference in perception of a past moment is only a matter of perspective. Remembering, on the other hand, is our ability to draw upon this huge reserve of perfect information. Remembering is like reading data from a hard disk into a computer program. As a programmer you open a file within your program, then read the data from that file into your program, and then close that data file. When we remember something from the past we are reading data from memory into the present moment. Remembering is fundamentally different than memory. Memory is the information reservoir. Remembering is the ability to draw from that reservoir. In the human case memory contains everything. Human memory has captured every moment of your life in its entirety. Memory has retained all the moments of your life in perfect detail, exactly like you experienced them the first time. Memory is perfect. Remembering is limited. This can be a difficult concept to understand because we do not experience our perfect memory during our lifetime. Our perfect memory will only be fully experienced at the end of life. If we accept the premise that memory is perfect then everything changes. Sometimes in scientific thought you have to make an assumption and see what falls in place. The assumption ist that memory is a perfect bit-for-bit copy of reality. It does not fade over time. When you accept this assumption everything comes into focus. In the digital world, copy does not apply. Copy is an analog concept. In the digital world there is the original and duplicates of the original. The duplicate is exactly the same as the original in every way. A copy connotes a diminished version of a pristine original. That is not the case in the digital world. The copy is identical. It is pristine as well. Our awareness of our surroundings comes when the surroundings gets manifested inside the mind. 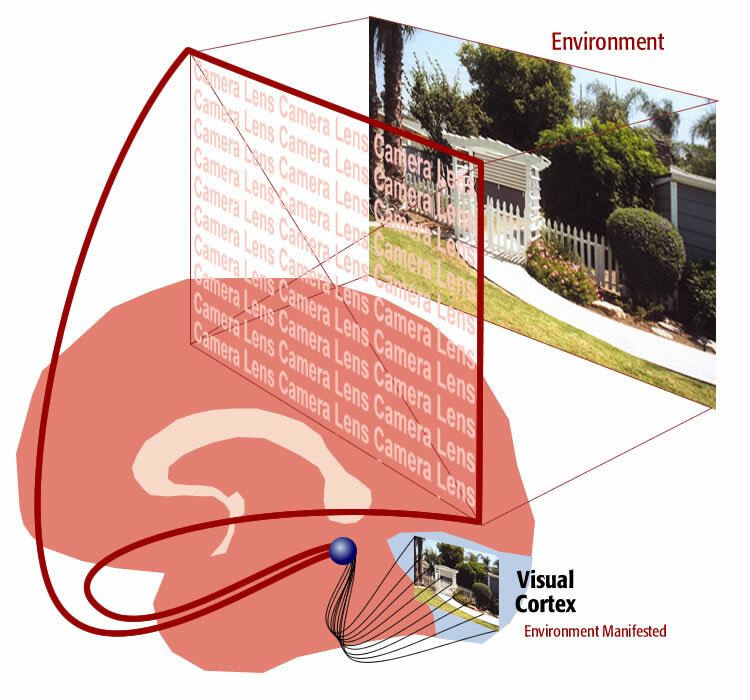 This means that when you look at your surroundings, you are actually looking at your memory. Your memory is your surroundings. When you see your surroundings this way something magical happens. 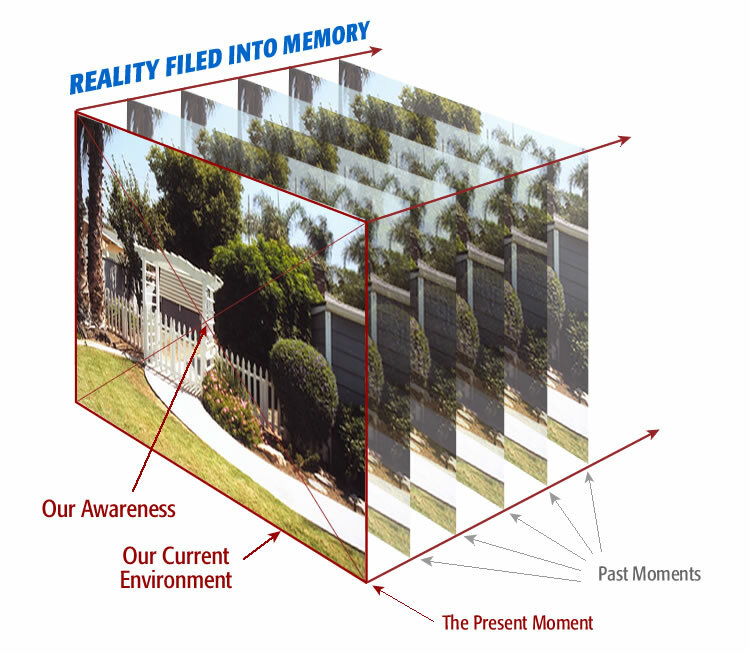 Your memory becomes your surrounding three dimensional space. It isn't that your memory is a copy of your three dimensional space. 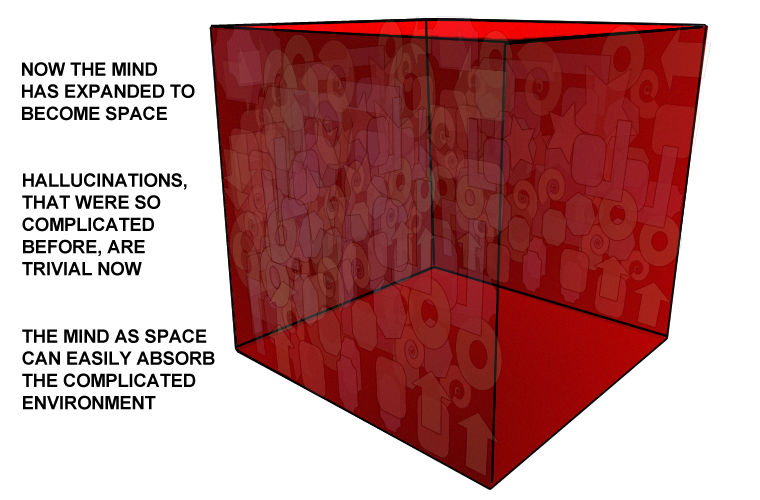 It is your three dimensional space. It is the outside world that is inconsequential. It is your memory that is important. 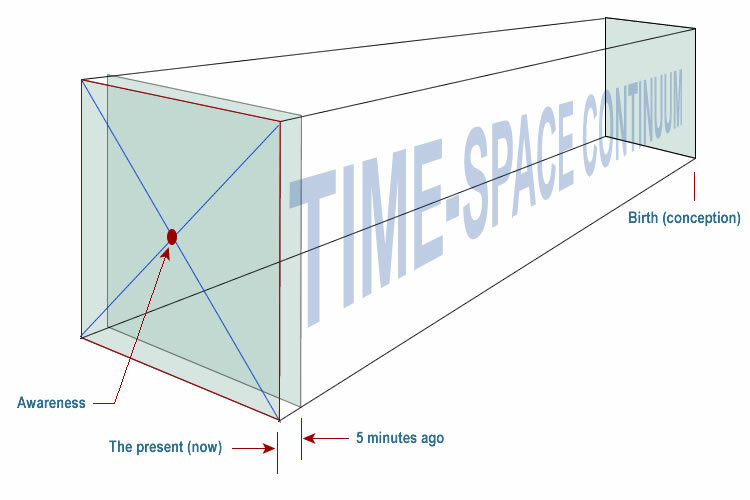 Memory as three dimensional space gives rise to another important concept. If we accept that your current moment is already in the mind when it unfolds, it means the three dimensional space is inside the mind too. 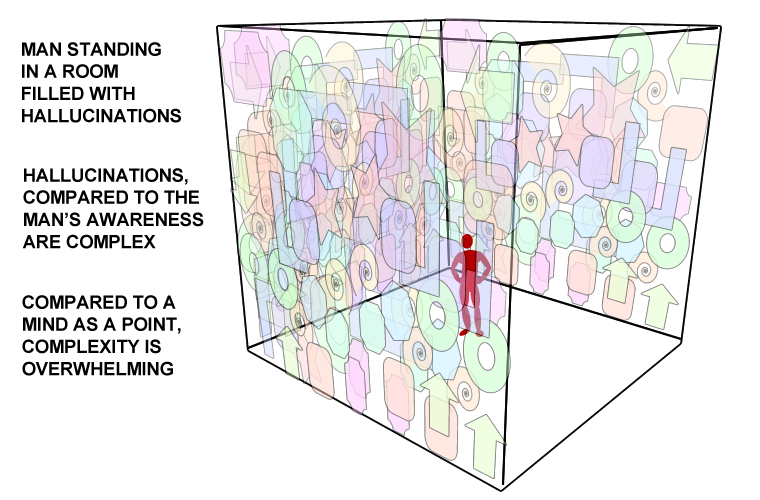 Another way to see it is that memory is three dimensional space. Memory is your surrounding space. The present moment is already in memory the moment you experience it. It is digital. There is absolutely no reason to believe that a bit-for-bit copy of reality will fade over time. The present moment goes into memory as a perfect copy and it remains that way. Our awareness moves forward in time. That displacement in time makes it difficult to look back at past moments. That perception of a moment becoming old is just a perception. That "old" moment is in memory; intact, exactly bit-for-bit as it was the moment we experienced it. Memory is the key. Memory is what allows our mind to absorb a universe. It is not an understatement to say that every individual (animals too) have an entire time space continuum within their mind. They are walking universes. All that is required is that memory absorbs the present moment, which it does, and those memories remain perfect over time, which they do. Think of your as memory reaching out to absorb the present. The present - the outside world - is within memory. We live within memory always, even the present. The present environment appears real to us. The rest of memory is real too in exactly the same way. Moments get absorbed into memory as we move through life. Awareness stays in the present moment. Just because awareness is not currently located within memories of the past does not mean that the memories of the past are not complete in every way. The memories of the past are just as real and complete as the present moment. We simply cannot realize past moments fully right now because our awareness is no longer in that moment. It is in the present. If we could move awareness into a moment of the past we would experience that moment exactly like we experienced it the first time. That moment exists. It has not gone anywhere. We just cannot play it back at this time. That does not mean, however, that we will not realize past moments fully in afterlife. 2. Can Memory Store Moments Indefinitely? If your mind is to going to capture and retain all moments throughout your lifetime we are going to need perfect memory. Is it possible for human memory to achieve this level of perfection? For this to be possible we need a memory device that can hold every moment you have ever experienced throughout your lifetime. These moments are complete realities including any thought going on at the time. We need to store them completely without ever dropping a bit. We are talking about a bit-for-bit recording of your entire lifetime. This is a lofty ideal. It does not seem possible. Everyone knows that cells do live indefinitely. There is turnover of the memory hardware within the brain. It does not seem realistic that the brain can make it through 125 years in life without ever dropping a bit. It would seem that the underlying hardware would eventually fail and lose the data that was stored in that hardware. Human memory is not a fragile system. It does not come crashing down when a single brain cell fails. There are ways to lose brain cells without losing the data stored in them. The computer industry has techniques where a memory device can fail completely and not lose data. Computer memory repairs itself by swapping in fresh memory when old memory fails. It can recreate lost data and keep running perfectly. This is not the only way to maintain digital memory, however it is a way to do it. 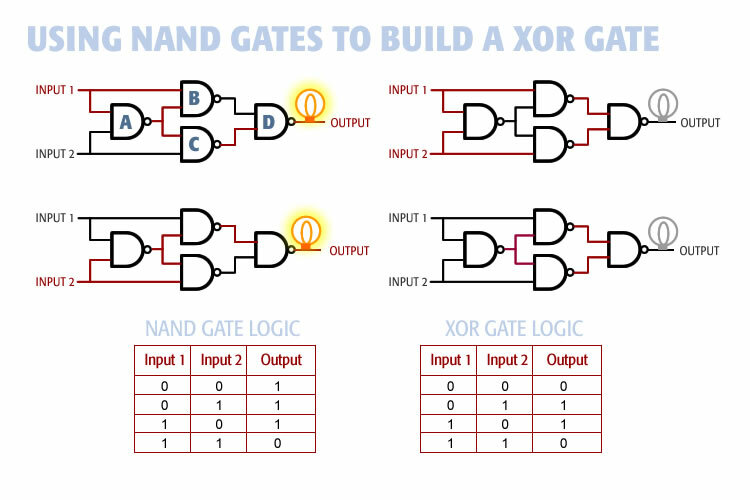 The diagram above shows an XOR Gate build from four NAND Gates. The logic table for the NAND Gate is shown on the lower left. Like an XOR Gate, a NAND Gate has two inputs and one output. If both inputs are ON current the output is OFF. If either or both inputs are OFF the output is ON. The logic table for the XOR Gate is shown on the right. 3. 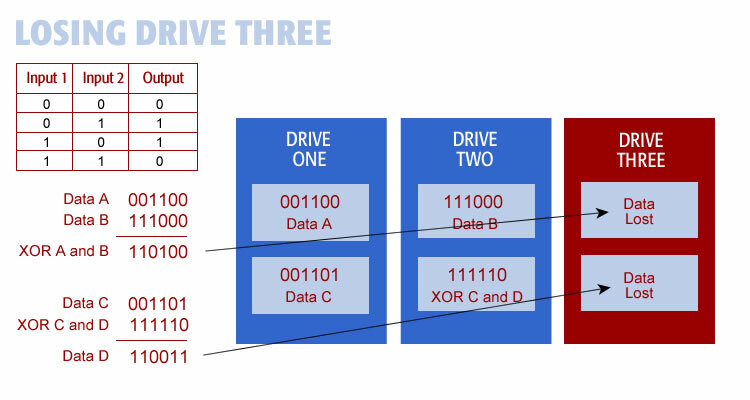 The two pieces of data are XOR'ed together and the result is written to Drive Three. Shown on the left is Data A that includes six bits of data: 001100. This is written to Drive One. Data B also contains six bits: 111000. That data is written to Drive Two. Then Data A and Data B are XOR'ed together and the result is written to Drive Three: 110100. You can see how the data values are XOR'ed together on the left. 3. 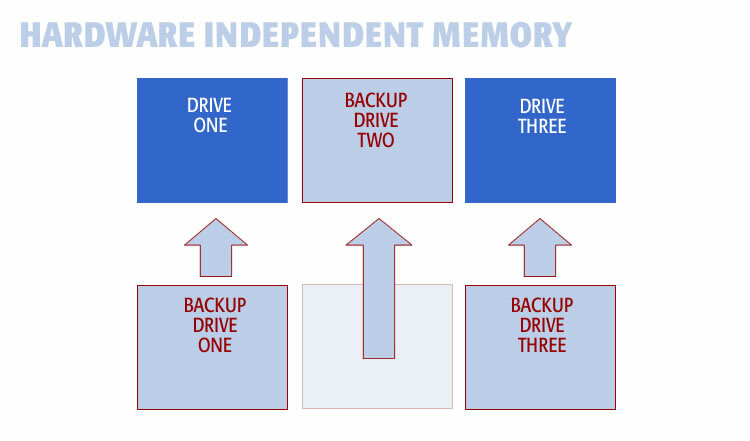 Drive Two's backup is automatically installed in the array. It is swapped in electronically. 4. 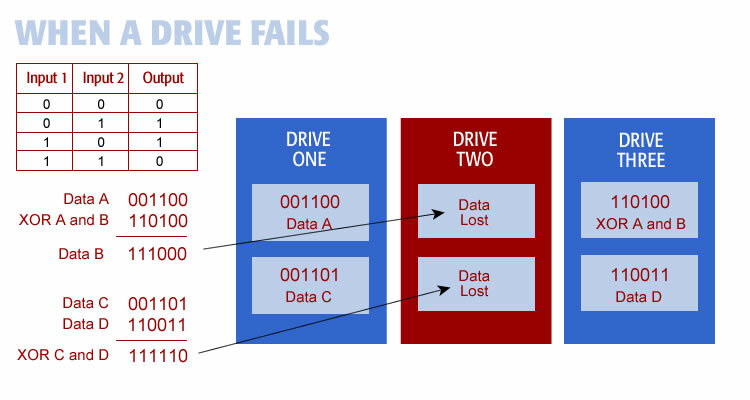 Drive Two's data is rebuilt by XOR'ing the data on Drives One and Three. 1. An XOR memory array can take a severe hit to the hardware and not lose data. Memory repairs itself without moving parts. 2. 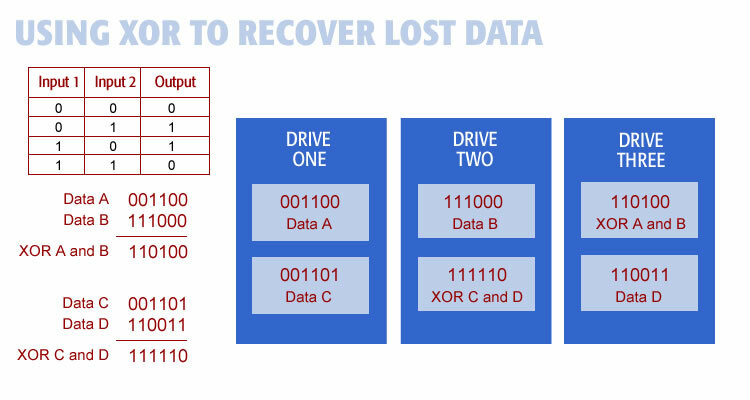 XOR memory can recover data lost without warning. A Drive can suddenly go down and the system can recover. It essentially heals itself. Lost memory can be fully rebuilt from existing memory. 3. 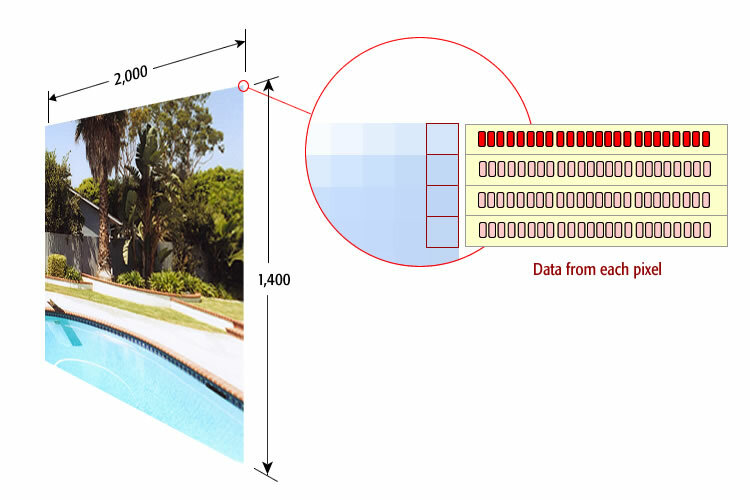 An XOR array works with any size data word and any number of drives greater than three. This means that we can protect a huge amount of data with very little additional hardware. 4. Humans spend one third of their life sleeping. XOR'ing data is the type of activity that takes place during sleep. Using an XOR array (or some variation of it) we are able to replace lost brain cells without affecting memory. A XOR system is capable of maintaining perfect memory throughout our lifetime by continuously replacing damaged hardware. To those of us that making a living as system administrators, our biggest fear is losing our client's data. A good system administrator will take steps to insure that no data is lost. It is not enough to merely monitor the situation. You have to build measures into your network. On my local computer I use a technique called Time Machine. Time Machine works in the background, making copies of everything I do, so the machine can be rebuilt should the primary drive fail. On my network I use a technique called Rsync. Rsync makes a copy of all files on another computer nightly. Additionally, you need to introduce new hardware into the network from time to time. A new computer will last about five to ten years. It is a lot of work to build a new server, transfer everything onto it, and configure it so it all works correctly. However, if you expect perfect data over decades it is absolutely necessary. Is it possible to have perfect data over a 100 year life span? The answer is yes, providing you use memory techniques similar to those above. This is where dreams come in. The human mind is a data-absorbing machine. It takes in each moment as it happens and files it away in memory. For this to happen over a lifetime without ever dropping a bit, you would expect to see nightly maintenance. Dreams are necessary data maintenance taking place. If the mind were to take in each moment, file it in memory, and leave it, it would fail. Instead the mind takes in each moment during the day, then performs data integrity maintenance during the night. Dreams are to the mind what the system administrator is to the network. Dreams do the necessary tasks, basically moving and organizing data, to see to it that memory remains perfect over decades. Thirty people watching thirty different football plays simultaneously represents collective knowledge. It shows how all the plays of the game could potentially be played back at once. That same potential, playing back the moments of our life at once, awaits us at the end of life. 1. Imagine recruiting different people to experience each moment your life. You have one person to experience each moment of your existence. You have a separate computer monitor for each person. Exactly like watching each play of the game simultaneously, you have everything all set to go. 2. There are 2,365,200,000 seconds in a lifetime of 75 years. This is an approximate estimate of the number of seconds in a lifetime. 3. Imagine recruiting 2,365,200,000 different people to each experience one moment of your life. 4. Then throw the switch and have everyone experience one second of your life simultaneously. That experience, the collective experiences of all 2,365,200,000 people happening at one time is the type of thing that awaits us at the end of life. This is probably understated but this is the order of magnitude of potential stored in memory. 1. As we approach the end of life we have everything in memory. We have every moment in memory exactly as it was when we experienced it the first time. This is the potential we carry with us as we move through life. This is the potential we have with us at our last moment of life. 2. At the end of life, time ceases to exist. Awareness is free to go everywhere throughout memory. Memory holds all the moments of life. So awareness is free to go throughout your life. Since memory contains time, what was formally a position in time (now) now becomes all time. We undergo a transition from a moment in time to all of time. 3. Like birth, this transition from a moment to all time, happens in an instant. Awareness has undergone dimensional change. It has gone from position in time to all of time and it happened in an instant. Awareness did this by expanding into the memories that we gathered throughout our lifetime. Memory contains everything. It absorbed every moment as you experienced it. It retained all moments. We carry these memories with us throughout life. We just never realize them during life. Except for limited remembering we are unaware these memory exists. At the end of life all memories are realized. We become aware of them all simultaneously. A that precise moment we become aware of all our memories at once. 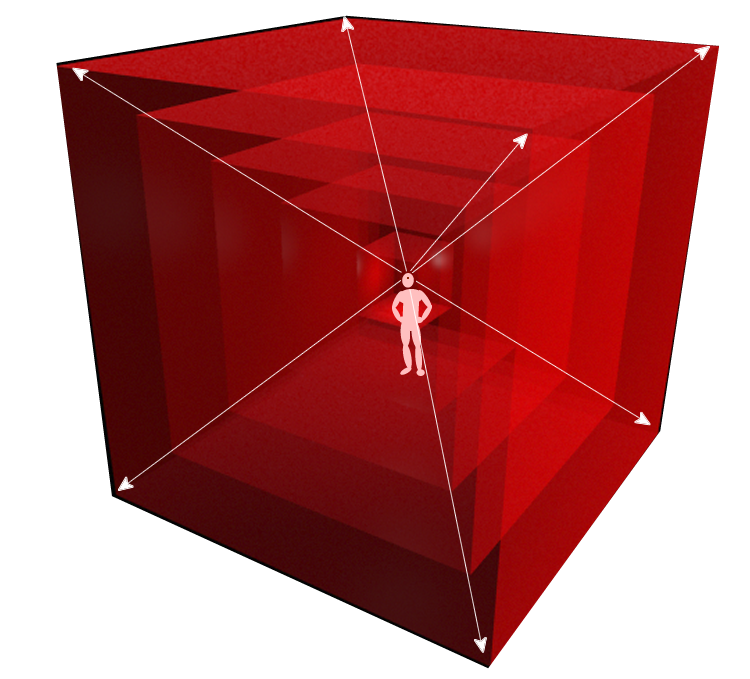 The geometric implications of afterlife should not be overlooked. To see how memory and awareness work together we have to look at geometry. During life we are located at in position located in time and space looking out at the world. This is only half of life. While we are awareness looking out at the world, we are also memory absorbing the universe. Life is made up of both things, memory and awareness. In terms of geometry awareness is our position in time and space. Awareness is our point of view from where we view the universe. In geometric terms awareness is a point. It has position only. Memory, on the other hand, is time and space. Memory is the space and time surrounding that being. These two things - memory and awareness - make up life. Life is not awareness alone. It is both awareness and memory. We go through life this way since the beginning. Think of it as a point of awareness surrounded by a time-space of memory. At the end of life nothing changes. 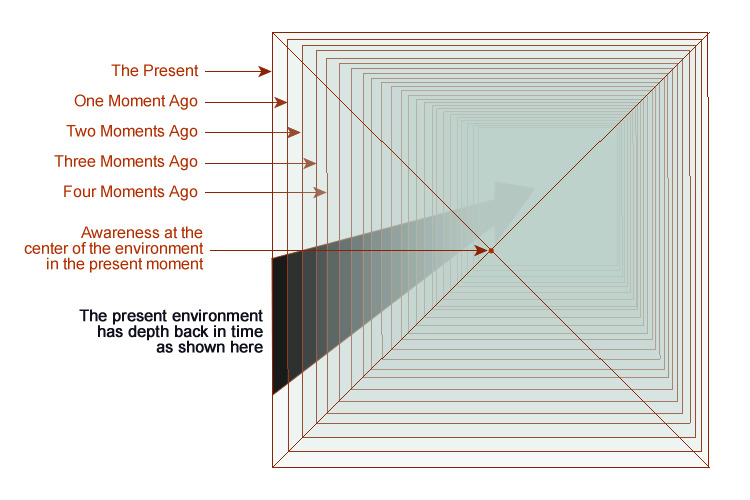 The time-space continuum, in our memory, is there with us in the present moment. We carry it into the end of life. At that moment life ceases to exist, awareness explodes throughout memory into all time and space. At the end of life we go from experiencing one moment (the present) to experiencing all of time. In like manner we go from position within space to all space. Not only do we expand through time we expand through space as well. As we go from point of view within space to all space, we do that for all moments throughout life, not just the present. At the end of life we undergo a dimensional change where the smallest possible thing (position within time and space) becomes the largest possible thing (all time and space). Afterlife is the moment in time when we become everything. It is when the good work of life comes to fruition. Memory is not dependent upon the physical world. Memory is fundamental to life exactly like awareness. The two work together. They are the same thing except one is of a different dimension. Awareness has no length, width, depth, or duration. Memory has unlimited length, width, depth, and duration.They are perfect mathemtical inverses. Afterlife is when awareness makes the transition between the two. Afterlife is the geometric inverse of what we are now. We are position now. We become everything later. It is too grand, too emotional, and too magnificent to comprehend. This holds true for every one of us. It holds true for all living things. This concludes proof of afterlife by memory. I, like every Californian, watched the "Trial Of The Century". The trial spanned eleven months starting with the jury being sworn in at Los Angeles County Superior Court on November 9, 1994. The defendant mounted a defense led by the dream team. They brought in witness after witness. The trial was televised in the US. Both sides went into infinite detail. This drug on daily for almost a year. When Proof Of Afterlife watches this, we have a different opinion. As the facts unfolded it became obvious the defendant did the bad deed. But they defense kept probing, calling witnesses, cross examining, calling sidebars, postponing and every other legal trick possible. The legal tactic was to draw things out, question everything the prosecution said, and develop an emotional connection with members of the jury. You could say the defendant was fighting for his life, so why not employ every strategy possible? After all, the defendant was in expert in sports. He knew about defense. So he fought back. If he wins, did he save his life? If he is acquitted of murder, is that the end of it. Is he exonerated? The defendant is not getting away with anything. The moment is in memory. It lies up ahead. It is in memory waiting to be experienced in afterlife. Judgment day, the real judgment day, is coming. Even if you convince everyone on the jury, everyone in court, and everyone watching that you're innocent, that judgment does not matter. It does not matter because you cannot convince yourself. You hope it goes away but it will not. Here's what it looks like to go back in time and find that moment to see what really happened. As you look at this imagine this is going back into memory. Each one of these cans contains a moment, not a day. Each moment, from conception to now, exists here in memory. These aren't copies of moments, as the film cans shown here. These are the actual moments. In the case of the Trial Of The Century that moment exists. If we had the technology we could go back like this, find the exact moment, open it and take a look. Then we could see what really happened. The notion that the criminal got away with a bad deed because he was acquitted is not true. This whole notion of getting away with a crime is flawed because it isn't the jury that sits in judgment. It is you that sits in judgment. We should not give ourselves permission to do bad things because we can get away with it. The world's judgment is not a criterion that matters. All that matters is what you (and God) think. Let's say you decided to do something bad and didn't get caught. So that moment gets absorbed into memory. You can argue that I lived thought it once and I can live through it again in afterlife. I can handle it. That isn't how it works. You don't get let off that easy. When you experienced the moment for the first time, you experienced it in life. In life, awareness is a point moving through time. During life, the experience was temporary. Yes, you were uncomfortable for a while but it passed. You move on. It is behind you. You can forget about it. No you can't. The moment is there, intact. During life you can refuse to remember it. But in afterlife, the second time you experience the moment, there isn't going to be any time. That is a huge difference. Awareness is location within time. Memory is time, everlasting. So what you thought was just a minor blip on the timeline of life comes back amplified. It never goes away. There is no getting beyond it. We all do bad things. Me too. We cheat a little bit. We lie a little bit. That is not what I'm talking about. I'm talking about doing deliberately harmful acts based on thinking you can get away with it. Like the video shows above, we will be going back and taking a look. You can depend on it. Understanding afterlife memory-dimension imposes responsibility during life. Do you really want that experience in your everlasting universe? It is a question you should ask. This isn't a simple straight-line proposition. For example, let's say you know someone who has suffered terribly with an illness. You could conclude that their everlasting universe has been affected due to the suffering. No so. That isn't how afterlife works. Embedded in this is the concept of inverse. Those who suffered illness during life will not only be made whole, they will be ecstatically healthy. Those suffering during life will be rewarded when life turns inside out. Suffering gives rise to the opposite, health and happiness. If you are poor during life you will be rich in afterlife. If you are lonely during life you will be among loved ones in afterlife. If you are sick in life you will be young and healthy in afterlife. Afterlife is for everyone, animals too. Everything works out perfectly in the end. Life is not meant to be easy. It is a struggle. Afterlife is the reward for enduring that struggle. Afterlife is the ultimate retirement program where you become surrounded by and imbued with joy, friends, health, knowledge, and happiness. Afterlife is the unlimited reward for having lived life.